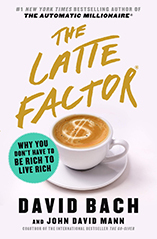 I read David’s book The Automatic Millionaire. I immediately increased my 401K deduction at work. It is only 4% but, I will increase it again when I get a raise–my raise will go into the 401(K). I am going to purchase the books and give to my 2 married children. Thank you for a GREAT BOOK. I have read many but, David’s has been the most helpful. I got inspired by him. Incidently, I have paid tithing for years!! Thank you.